Obverse: UKRAINA, year 2008, the small coat of arms of Ukraine, inscription "2 GRIVNI" (with Cyrillic letters) meaning "2 HRYVNI", at right the logotype of National Bank of Ukraine, on the sides drawings reproducing adornments from the ceiling of the Marble Hall - the former Great Synodal Hall of the Metropolitan Palace, inside which in year 1918 the Union of Bucovina with Romania was voted Reverse: the facade of the main building of the university - the former Palace of the Orthodox Metropolitan of Bucovina and Dalmatia, viewed through three arches separated by two columns (belonging to a portico from another building from the architectural complex), inscriptions "CERNIVETSKII DERJAVNYI UNIVERSITET" and "125 ROKIV" (with Cyrillic letters) meaning "NATIONAL UNIVERSITY OF CERNĂUŢI" and "125 YEARS"
This coin was issued by the National Bank of Ukraine for the celebration of 125 years from the establishment of the University of Cernăuţi. The coin belongs to the "Higher Educational Establishments of Ukraine" series. 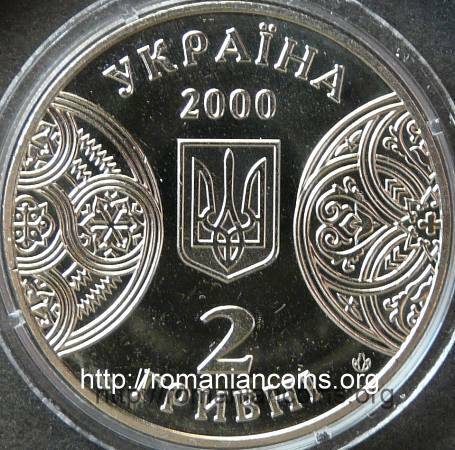 The coin design was created by Ukrainian artists Mykola Kochubey, being engraved by Sviatoslav Ivanenko. 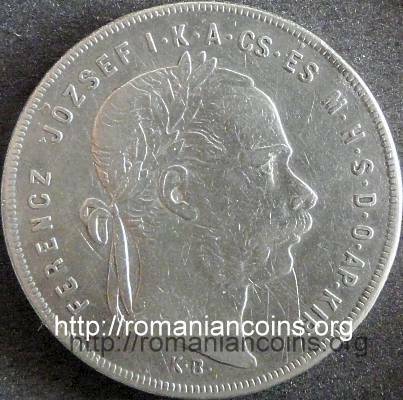 This coin appears on Romanian coins because the city of Cernăuţi played a very important role in the history of medieval Moldavia and of the modern Romania. The University of Cernăuţi was established in year 1875. At that time the city of Cernăuţi (along the entire Bucovina, stolen from Moldavia in 1775) was part of the Austria-Hungary, so the university was named - expectedly - after the ruling emperor Franz Joseph, and the studies were conducted there mainly in German. Following WWI and the Union of Bucovina with Romania, the university of Cernăuţi received the name of king Carol I of Romania. After WWII the northern part of Bucovina was occupied by Soviet Union. In 1989 the university was renamed after Yuri Fedkovich (1834 - 1888), Ukrainian writer born at Putila in Bucovina, and who lived for several years in Cernăuţi. 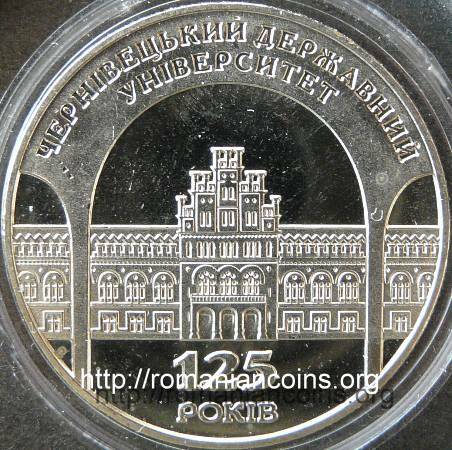 The building that appears on the coin is a part of the former residence of the Orthodox bishopric - Metropolitan Palace (from 1873 the bishopric became metropolitan), architectural complex erected between 1864 and 1882, as creation of Czech architect Josef Hlavka (1831 - 1908). 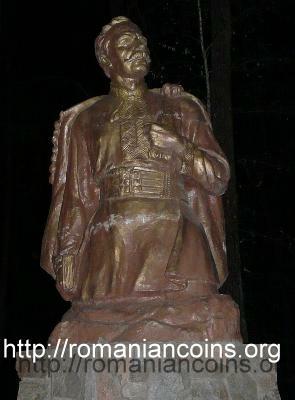 The construction was initiated by the Romanian bishop Eugenie Hacman (1793 - 1873), known mainly for promoting the teaching in Romanian in Bucovina. The inauguration of the complex took place in 1882, being made by Silvestru Morariu-Andrievici (1818 - 1895), archbishop of Cernăuţi and metropolitan of Bucovina and Dalmatia. Inside the building on the coin resides the Great Synodal Hall, in which the Romanian National Council organized the General Congress of Bucovina that voted on November 15th - old style / November 28th - new style the "Unconditional and eternal Union of Bucovina in its old boundaries over to Ceremuş, Colacin and Nistru, with the Kingdom of Romania". Nowadays this hall was renamed to „Marble Hall”. The adornments from the ceiling of this hall are represented on the coin obverse.